Chris Traina has been at the helm of the Nichols men’s soccer program since 2004. The Bison have made the Commonwealth Coast Conference (CCC) playoffs regularly and captured the 2010 tournament championship. 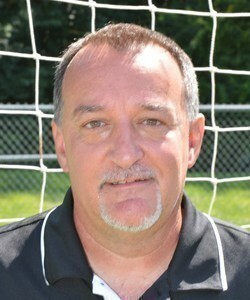 In 2010, Traina was awarded the CCC Coach of the Year for leading the Bison to the conference championship while coaching the CCC Rookie of the Year and seven All-CCC team members - one of which earned a spot on both the All New England Regional West First Team and NSCAA NCAA D-III All-American First Team. Nichols was also selected to host the NCAA Tournament first round matchup. Overall, Traina’s clubs have set or reset eight different records during his tenure as head coach, including five in 2010: wins (15), shutouts (13), consecutive shutouts (five), goals allowed (11) and goals against average (.490). In 2008, Nichols advanced to the CCC Championship game for the first time in 20 years and was selected to participate in the ECAC tournament. Traina previously coached the women’s soccer team at Nichols for four seasons, leading the Bison into post-season play every year. In 2002, he guided the team to the CCC championship title and to the first NCAA Tournament appearance by any team at Nichols. Prior to coming to Nichols, Traina spent four years as the varsity soccer coach at Shrewsbury High School, winning two league titles and a district tournament championship. He has over 14 years of high school and college coaching experience, and was also the coach of Juventus U-14 in the Massachusetts Premier League, where his team won seven tournament championships. Traina attended Keene State College and his playing experience spans from Auburn High School to Keene State and Worcester State Colleges, finally to the South Florida Semi-Pro League. In addition to his coaching duties, he also serves as the Nichols Recreation and Athletic Center Manager. He currently holds an NSCAA Advanced National Coaching License.